Yoga can help you find your inner voice to guide you through your practice and your everyday life. 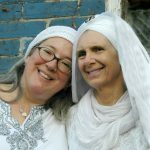 Kundalini yoga teacher training can also help you find your outward voice and project it, as you practice teaching classes and communicating compassionately with others. Yoga teacher training can be a humbling experience. We all have limitations, both physical and emotional. Delving deeper into your practice can help you let go of your ego and accept yourself as you are. There’s a lot to learn in yoga teacher training, from texts to chants to asanas. With 200 hours of Kundalini yoga instruction and practicum, it’s a lot to take in. But learning anything takes time and determination! So, take a few deep breaths and recognize that you’re on a lifelong journey of learning and strengthening your skills. 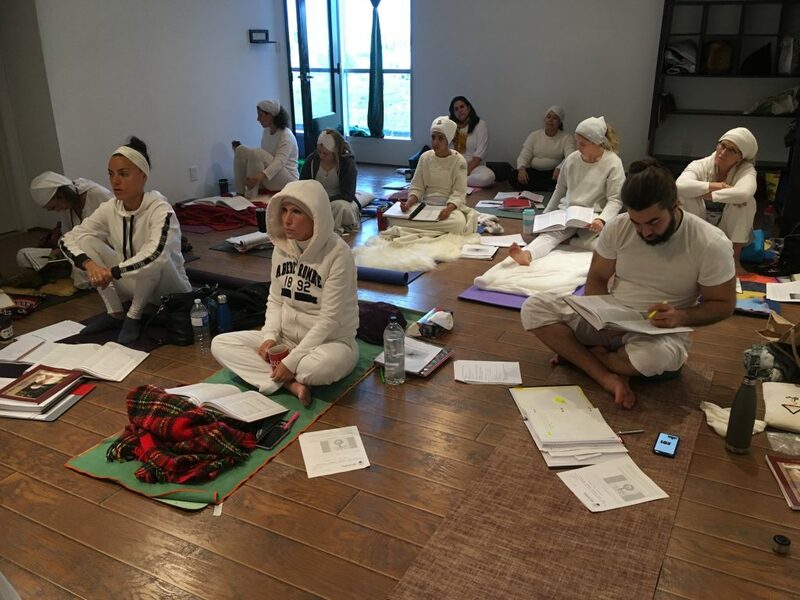 Attending a Kundalini yoga teacher training will allow you to experience a wide variety of teaching methods, which will help you find your own unique style. Do as much yoga as you can and take notes after your classes. What resonated with you? What would you do differently? With every yoga class you take during teacher training and even after it is all said and done, stay curious and observant; when you practice yoga, you are constantly learning. Join a global community of yogis as well as the community of your fellow trainees. You’ll make new friends and work together to connect with the universe and push each other to the limit. Our Kundalini yoga teacher training program is KRI certified and will truly be a life-changing experience. 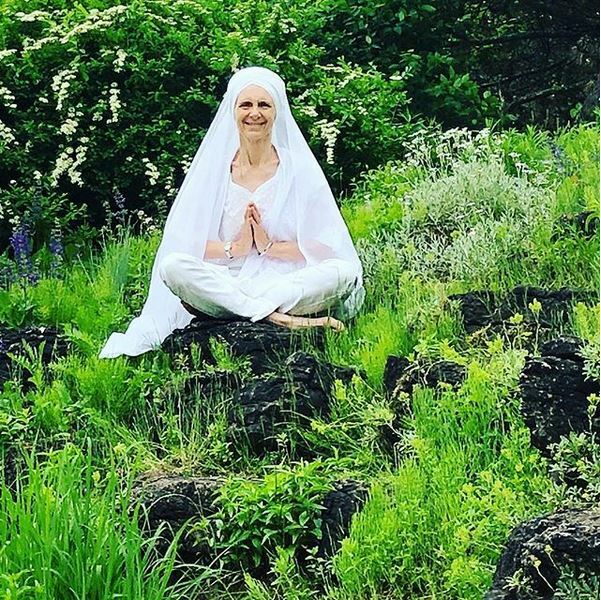 Embark on a transformational journey with us and enroll in our Kundalini yoga teacher training beginning in August 2019! Details about the program can be found here. We look forward to teaching you and learning from you! What is a yoga retreat? Well, it’s many things. It’s a break from the hustle and bustle of daily life. It’s an opportunity to further your knowledge and skills. It’s time for yourself, with yourself. A yoga retreat is anything and everything you want it to be and more. When you go on a yoga retreat, you are essentially breaking away from your daily routines, and that includes being connected to technology. It’s one of the most important detoxes you can do—taking a break from the laptop, smart phone, and social media. With a yoga retreat you can be in the moment, instead of deep in your work email. We often get stuck in our ways and become comfortable with our daily routines. So, although you may find comfort in the studio, park or room in your home that you practice yoga in, your surroundings are not conducive to learning and seeing from a new perspective. A yoga retreat can take you out of that comfort zone and push you to see the world and yourself in a new light; a truly liberating experience. Meditate by the soothing stream and breathe in the fresh air of the outdoors; a yoga retreat not only removes you from your comfort zone, but it puts you in one of the most beneficial environments: nature! Even the most advanced yogis still have much to learn about Kundalini yoga—and more importantly—themselves. A retreat allows you to surround yourself with other individuals willing to learn and amazing instructors ready to push you to reach your full potential. During your weekend filled with Kundalini yoga workshops, you will be exploring your practice in-depth and testing your strength, flexibility and mind while doing so. Everything you are gaining from a yoga retreat works towards releasing the stress from your mind, body, and soul. You will leave the retreat refreshed and ready to take on the world. There are plenty of things to think about before going on a yoga retreat, but we promise, the getaway is worth it. 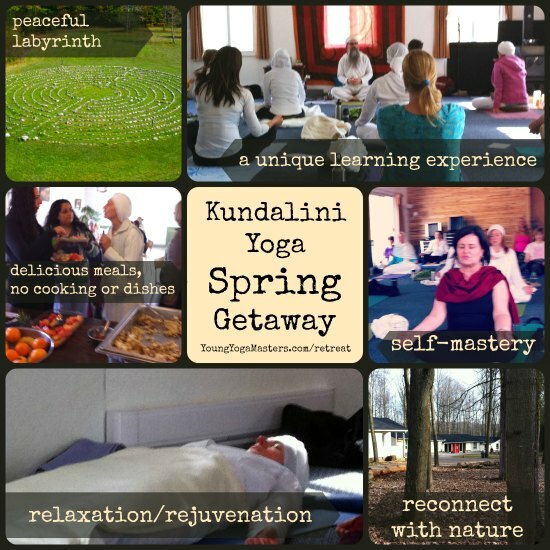 Come join us at our Kundalini Yoga Spring Getaway 2019 from April 12-14! 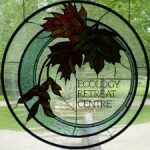 Find more details and information about the retreat here and contact Daya Kaur at 416-674-7083 or by email today with any questions you may have. Hope to see you soon! Kundalini Yoga is all about simplicity and exploring the personal energy you possess. We can do so by locating certain vibrations within ourselves and the universe. Chanting mantra is the way in which we open our consciousness, directing our minds to feel the small vibratory frequencies of our emotions. Everyday we are chanting silently to ourselves whatever crosses are mind as we experience the world. 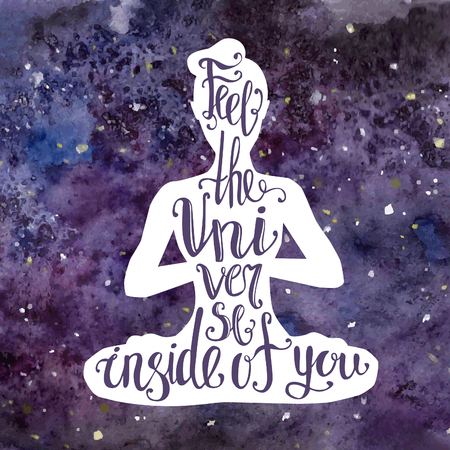 So, through Kundalini Yoga, you are able to harness specific vibratory patterns that cause a chemical reaction in your mind and body, not only positively shifting your thoughts but allowing you to send those vibrations out to communicate with the universe. Projection, pronunciation and rhythm all play a role in mantra. First you must ensure that you are projecting from your whole being; then you must focus on pronunciation and how your tongue hits the meridian in your mouth; and lastly, rhythm with Kundalini, is normally in 8 beats. 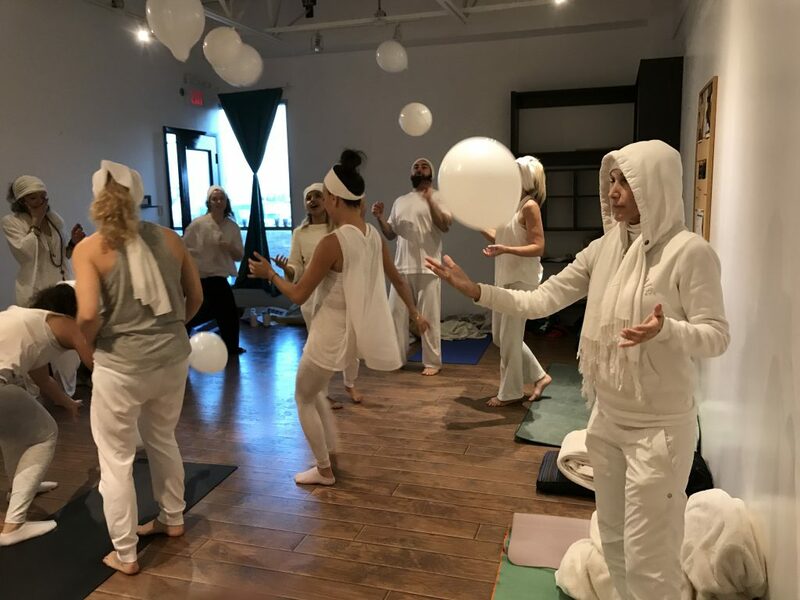 When we come together in Kundalini Yoga, we use chanting, sound, and rhythm to connect to each other and individually connect to everything in the universe that is vibrating along with us. 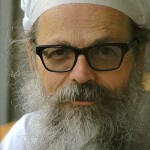 Check out this excerpt from a lecture given by Yogi Bhajan about what sound current is to him. Come join us at one of our upcoming classes to learn more about Kundalini Yoga and how you can create balance and harmony in your mind, body and spirit. Call Daya at 416-674-7083 or email her today! Come give 2019 a Kick Start and start the year off right! Payment by cheque or cash is also available. Early Registration is Highly recommended because space is limited and historically this event has sold out. Daya and Santokh bring a heart entered approach to teaching yoga. Daya Kaur has been living the Kundalini yogic lifestyle for 15 years. She is a Trainer for the 200 Hour Level 1 Kundalini Yoga Teacher Training. 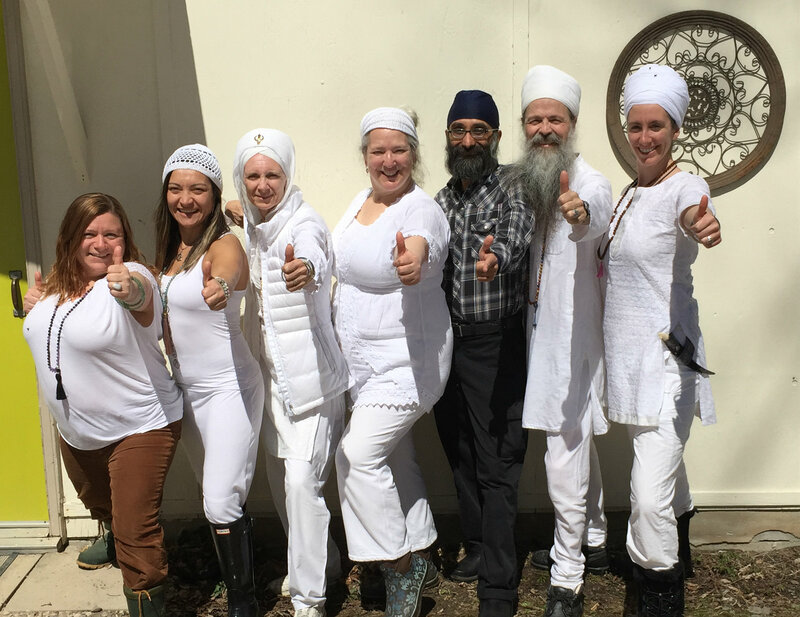 Kundalini Kick Start 2019 Register Early to Reserve Your Space! $190 + fees & taxes ($225.04) – per adult. $160 + fees & taxes ($189.61) – per full-time student or senior over 65 (with ID). Wear loose comfortable clothing, preferably white (white combines all the colors and enhances your magnetic field and auric strength). $180 + fees & taxes ($213.23) – per full-time student or senior over 65 (with ID). Space is limited to floor space in the Sadhana room and common areas of the Ashram. Contact Daya Kaur for information or to reserve a spot at WTY@TorontoKundaliniYoga.com . You’ll be guided by teachers with over 50 years of Kundalini Yoga among them for a weekend of fun, fitness, and friendship. 4 – 6 pm: Unwind! 2 nights lodging in the Ecology Retreat Centre Lodge or Bunkhouse (bedding and towels included). The Lodge has 15 individually heated bedrooms with 3 beds in each (one double bed and two singles) sleeping a total of 45 people. 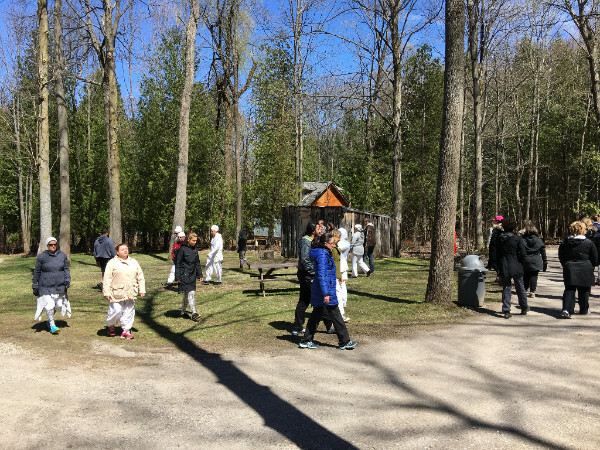 Spacious shared washrooms (separate male and female) with 8 showers and 12 sinks. It’s bright central lounge can be used for socializing or as another meeting space and it is just steps away from the yoga room and the dining hall. The Bunkhouse offers stream-side quarters that can sleep 20 people in 5 rooms rooms with 2 bunk beds (4 beds) per room. 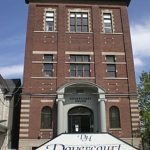 It was recently renovated and now has all new windows as well as upgraded bathrooms and new showers while maintaining its rustic look and feel. It is located a stone’s throw away from the Lodge. All accommodations includes towels and bedding. One weekend will make a big difference. One physical, three mental, and six energy bodies. Yogi Bhajan discovered this system in his travels in India. The Ten Bodies are powerful capacities of the psyche, each one possessing specific gifts that manifest when strong as well as certain deficit tendencies that surface when weak. 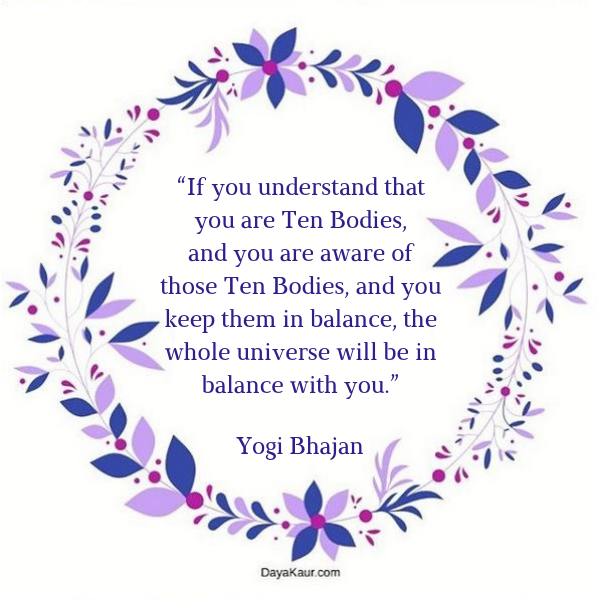 The art and science of the Ten Bodies allows you to realize that any disharmony you experience can be identified and then restored. As the title suggests, the first body is our Soul. It is our spirit flowing through us and acts as a foundation to build upon and discover who we truly are. Through the Soul Body, we are able to live from our heart, rather than our head. 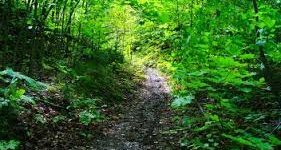 This body is constantly at work, determining the risks and danger in our surrounding environment and evaluating its potential to negatively affect us. As the Negative Mind works to keep us safe and assess the danger in our environment, our Positive Mind works to find the opportunities in life that will be beneficial for us. Our willpower stems from this body and encourages us to explore the world around us. This body is your guide. It evaluates the information provided by the Positive and Negative Minds and leads us to the best course of action. The Neutral Mind is compassionate and intuitive. This body should be very familiar to us! This is the temple where all bodies dwell, giving us the opportunity to balance ourselves. This body is your halo, spanning across your hairline and brow from ear to ear. Women have a second arcline across the breast line. This body helps us understand and project what we’re feeling. Our seventh body is our auric field. Surrounding our Physical Body, this electromagnetic energy field protects us like a shield, enhances our self-confidence and gives us a platform for elevation. This body is responsible for bringing in life force as you breathe, constantly working to supply us with the energy we need to stay motivated and achieve our goals. Our Subtle Body works closely with our Soul, and allows us to look beyond the reality we are living in. Our tenth body supplies us with the courage we need and the radiance we have within. A well-developed Radiant Body will be magnetizing to others because it is easily recognized through their charisma and personality. Surprise—there is an 11th body! The 11th body exists when all ten bodies are balanced, and you have allowed Infinity to consistently flow through you. This is a philosophy that is practiced through Kundalini Yoga. The systemized kriyas, use of breath, mudras, and sound work to balance and activate the Ten Bodies giving you a comprehensive way to work on all of them at once. If you are interested in learning about and exploring the Ten Bodies, feel free to join us for one of our upcoming Kundalini Yoga classes. Contact Daya Kaur at 416-674-7083 or by email today! 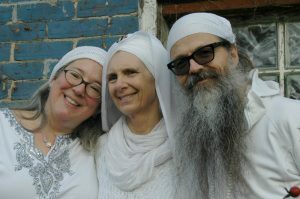 It’s a question that many wonder, but never seem to ask: Why do we wear the color white when practicing Kundalini Yoga? 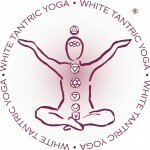 Wearing white during Kundalini Yoga influences your aura and creates a more powerful projection. Your aura is unique to you and it is a power that you should be continuously working on to grow and shape to achieve a healthy auric field. A healthy aura is one that creates a strong presence and enhances personal power, successfully fending off negative influences that attempt to penetrate us every day. By wearing dignified clothes that are white or ivory, you can create a more powerful interface between you and your surrounding environment. The color white contains the energies of all colors, expanding your personal energy when you wear it. To the naked eye, white is just one color. However, white includes the entire spectrum of light energy. So, wearing white allows you to utilize the energies of all colors, finding support and strength in all eight chakras. Display your pure self-identity through your choice of dress and create a deeper connection with the people around you. No matter what, your style of dress should reflect who you are and your personal commitment to your inner self. Not only will it help you take in the outside world and encourage your own self-reflection, but it will push others to look inward as well. As a result, this creates a subtle, but powerful communication with others. Wearing white and strengthening your overall presence will attract others, which is why most teachers dress in white. When you join us for Kundalini Yoga as taught by Yogi Bhajan, you are free to wear whatever you feel will help you reflect inward and create a beneficial and healing experience for yourself. 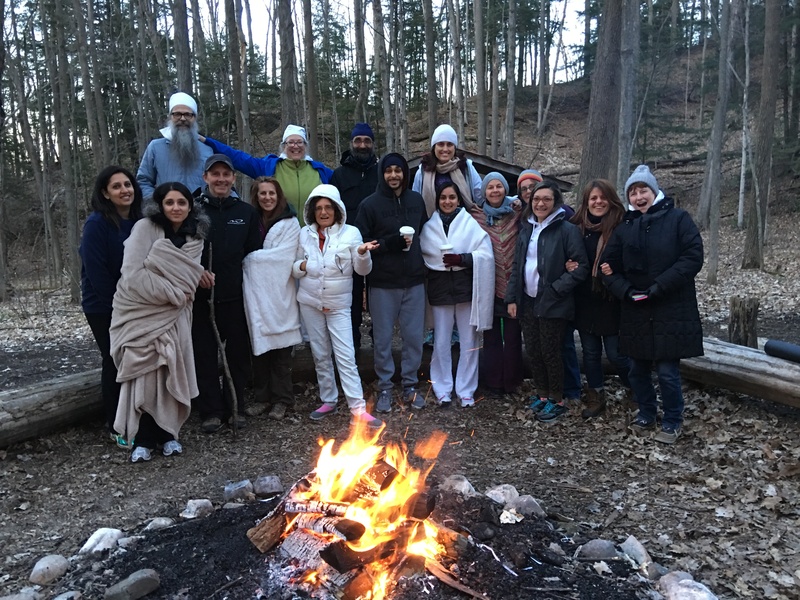 Browse through our upcoming classes and if you’d like to learn more about the impact of wearing white or Kundalini Yoga, contact Daya Kaur at 416-674-7083 or by email! There are 25 different types of yoga, if not more that exist around the world, and all of them work towards strengthening the mental state and physical body of the individuals who found personal satisfaction and peace in the art. The differences between these variations of yoga are often not apparent to everyone and we have found that many have blurred perceptions about what Kundalini Yoga is compared to the rest. 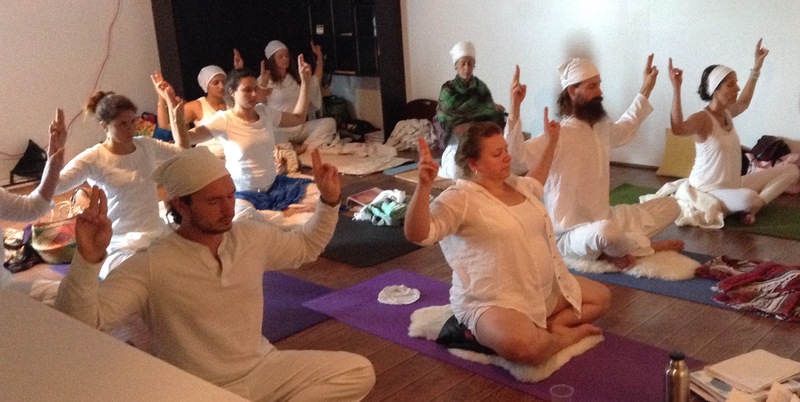 Kundalini Yoga is the yoga of awareness and provides a more spiritual experience. Kundalini means “coiled” which refers to the dormant feminine energy we all possess, or Shakti, at the base of our spine. The postures are formed with our eyes closed so that you can focus inward and feel your exact movements, helping you understand your body and the pose you’re performing—instead of focusing on what the other students are doing. Closed eyes strive to eliminate distractions and self-consciousness so that you can find balance and achieve your personal goals. There is a large emphasis on breathing and sound to break through your internal barriers. Kriyas are the repetitive postures and breathing techniques performed during this type of yoga, and when combined with the sounds of beautiful music or chanting mantra, a healing effect occurs. A feeling of positivity is draped over your thoughts and between, the chants, music, and gong, there is a natural vibration that is created to awaken your body and mind. You breathe into your posture and feel what your body is ready for. That’s why Kundalini Yoga is truly for everyone! If you are moving in the right direction, and focusing inward on the pose you are performing, you are still doing wonders for your mind and body. Kundalini Yoga is all about going at your own pace and feeling what is right for you and finding what you can do to put your body and mind at ease. However, one thing that we know to be true about every form of yoga is that they are working towards the same goal: finding and nurturing the creative potential within you. No matter which variation of yoga you choose to practice, it’s important that you allow yourself an opportunity to heal and rejuvenate, breaking yourself out of a confined and mundane routine. 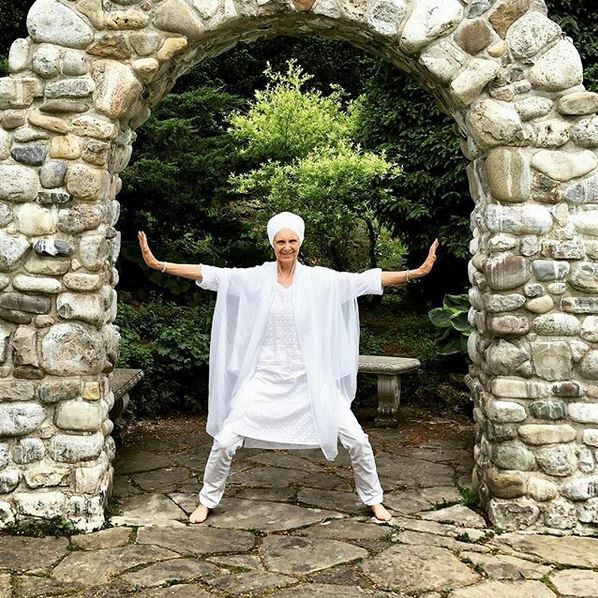 Come find your own path and immerse yourself in Kundalini Yoga as taught by Yogi Bhajan today! We have several ongoing classes and if you have any questions, feel free to contact Daya Kaur at 416-674-7083 or by email. “If you want to learn something… read about it. If you want to understand something… write about it. Take the next step on your journey toward the Self and the Soul with The Aquarian Teacher – join the global community of practitioners and teachers serving to make the world healthier and happier each and every day. 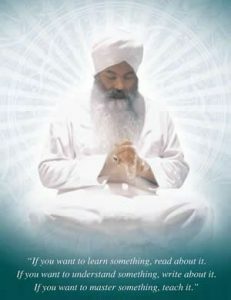 The KRI Level 1 Fountations Course is a professional program in the theory and practice of Kundalini Yoga as taught by Yogi Bhajan. This comprehensive course includes 200 hours of classroom instruction and practicum. 10% Student Discount for full time students and seniors. This fee includes the KRI Teacher Training and Master’s Touch manuals plus many handouts but does NOT include payment for the required 20 yoga classes or White Tantric Yoga. Refunds (minus a $500 Administration Fee) are available up to April15th, 2018. If you cancel after April 15th, no refunds will be provided. 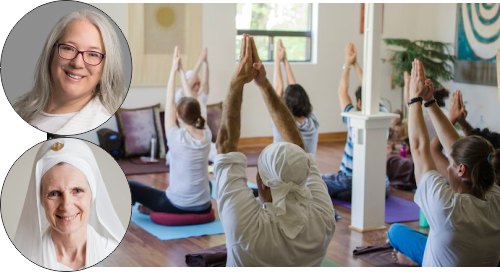 Nirmal Singh, a certified Kundalini Yoga Lead teacher trainer teaches the KRI Level 1 yoga certification course in Toronto and other cities. Nirmal holds the teachings of this ancient yoga (as taught by Yogi Bhajan) with utmost respect. He is sincere in his committment to the yogic lifestyle. Har Prakash Singh is a certified teacher trainer, instructor, and teacher of Mindfulness Meditation in the algorithmic secular style of Shinzen Young. He has a passion and gift for teaching meditation in any style and how meditation can be deepened for yogis at any level. 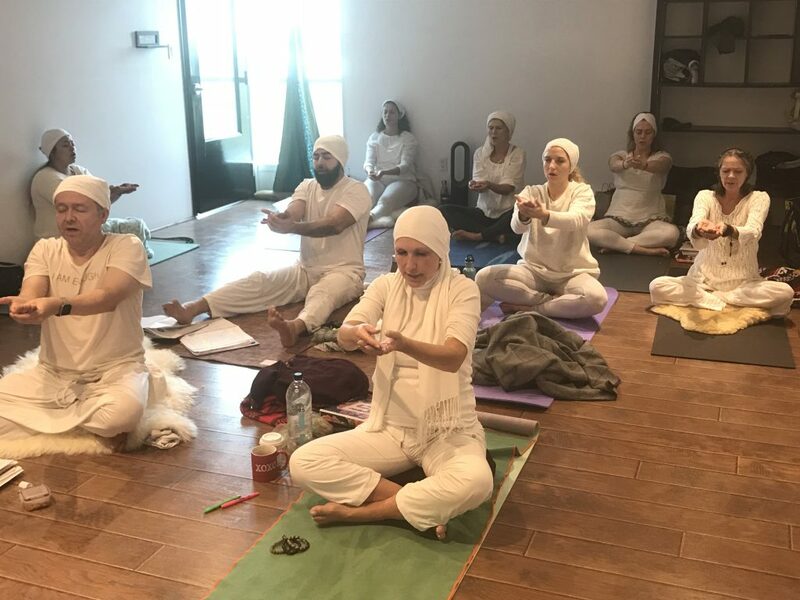 Daya Kaur, a certified teacher trainer, has been practicing Kundalini Yoga since 1996 and you can find her all over Toronto teaching more than 10 packed classes a week. Daya thrives on sharing this knowledge and guiding others on their personal path. Karan Kaur brings her training as a massage therapist into her understanding of yoga and alignment. She is a certified Level I, Level II Kundalini Yoga Teacher, and an intern with the KRI Trainer Academy. An avid yoga practitioner for 25 years, she discovered the teachings of Yogi Bhajan in 2005, and thus began her journey with Kundalini Yoga. 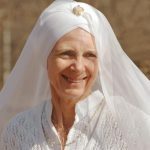 Karan Kaur inspires her students to transform their lives through the sacred science of Kundalini Yoga, while expanding their awareness of the world within. She teaches with enthusiasm, grace, passion and joy.